Every year, the millions of trees that shade the northeast corner of the USA signal the arrival of Fall with an explosion of red, purple and gold. As we journey from Manhattan Island to Boston and beautiful New England on this East-Coast USA tour, you’ll witness their splendour, framed against the still-blue skies. Flights also available from other UK airports – Belfast City George Best, London Heathrow, Manchster & Newcastle – click here for more information on available dates and prices. Come with us to downtown Manhattan. Explore on your own, or join our tour of the “city that never sleeps”. Marvel at the Empire State and Chrysler Buildings, bustling Times Square and the green acres of Central Park. Walk down Wall Street, and look across the water to the Statue of Liberty. and enjoy stunning views of the city from Top of the Rock, atop the Rockefeller Center. Heading north today, towards the beautiful New England states, we’ll make a stop at the Yankee Candle flagship store in Deerfield. Browse the candles, and Christmas and Hallowe’en novelties, and relax in the cafe, before we continue to Mount Snow, our base for the night. A marvellous day awaits as we delve deeper into the Green Mountain State of Vermont, where the maples, cedars and aspens are ablaze with red, orange and golden leaves. 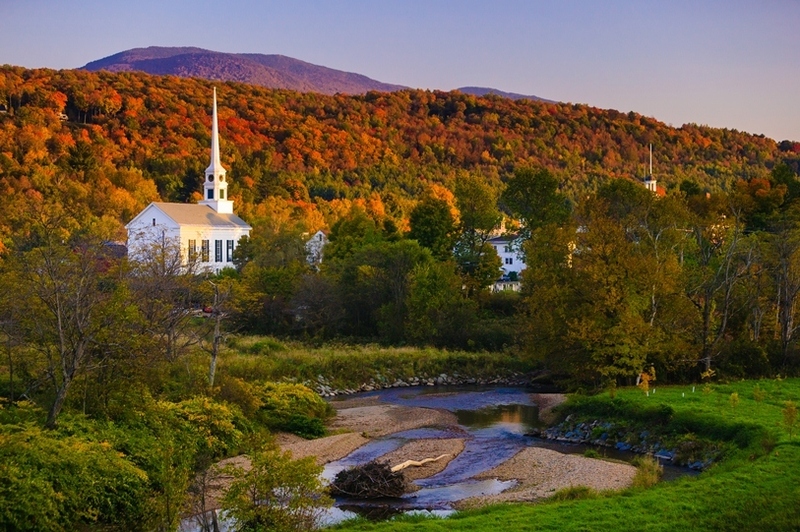 Visit the quintessential New England village of Woodstock with its covered bridge and traditional Main Street before we cross the Kancamagus Highway – often voted best spot for foliage viewing, or leaf peeping as it’s sometimes known – on our way to North Conway and then Bethel, Maine, for our next two nights. Journey to Boston, one of America’s most elegant, welcoming cities, today. Follow the famous Freedom Trail past the gold-domed State House and the Old North Church. Wander colourful Quincy Market, the Harbourside and the wonderful New England Aquarium, and cross the Charles River to the home of Harvard University. Alternatively, join our optional guided city tour to see where America’s Founding Fathers once strolled. Our final day sees you head to New York to board your overnight flight back to the UK. On your way, call in Plymouth, where the historic streets of ‘America’s Hometown’ were once trodden by the first settlers, and fashionable Newport, Rhode Island, where ‘weekenders’ cottages’ are opulent mansions.